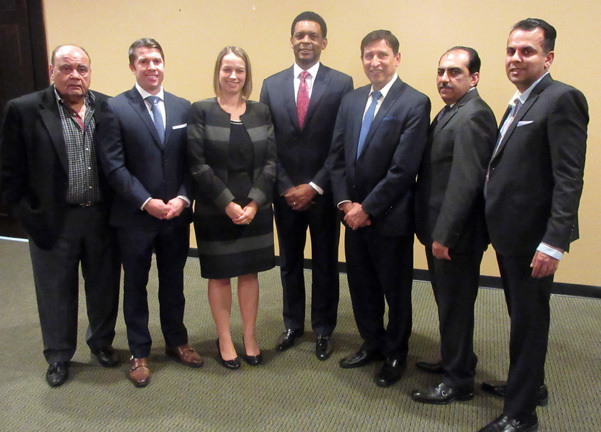 The Wells Fargo Advisors group of (from right) Amit Jain, Jacky Daryananani and Asheet Yagnik presented some concepts for planning for retirement with their team of product vendors (starting second from left) Kyle Anderson of Jackson Retirement Solutions, Natalie Holden with Touchstone Investments and Victor Frazier with Alger Funds. On extreme left is Narender Sehgal, the owner of Narain’s Bombay Brasserie where the function was held. HOUSTON: It was a small group of people who had many of the same concerns that many working class people have at a certain point in their careers: how to handle their nest eggs and make them grow and how to trust the advice they receive from wealth managers. It is a concern that many leave unattended way too long till they get older and come face-to-face with the dilemma of retirement income. For others, getting educated about investments is a crucial part of making sound financial decisions. Some among them were astute at making money but lacked the time to manage it. All of them listened intently when the three speakers in the short, focused seminar started to describe their products. Brought together by the Yagnik, Daryananani & Jain Group of the Wells Fargo Advisors in Sugar Land, the seminar was held over a buffet dinner at Narain’s Bombay Brasserie on Wednesday, January 23. In fact, the restaurant’s owner, Narender Sehgal not only is a client of YDJG, he even made some opening remarks about how satisfied he is with their performance. The senior partner in the group, Asheet Yagnik has a long track record of providing sound financial advise to his clients and increasing their portfolios. He began the seminar by stating that “it’s who you trust and how they manage and preserve your wealth” that matters in selecting investment strategies. He other partners Jacky Daryananani and Amit Jain chimed in throughout the seminar. First among the three featured speakers was Victor Frazier of Alger Funds, a 54-year-old firm started in New York by Fred Alger based on the principle of growth investing and currently is managing over $28 billion in assets. In light of the stock markets’ recent volatility, Frazier touched on the 20 percent downturn in the 4th quarter, stating that it had nothing to do with fundamentals but more with trade wars and tariffs. He said that the Real Fed Fund Rate was less than 1 percent and only signaled a recession if it was more than 2 percent. “We can’t duplicate the 3% GDP of 2018, and will slow down in 2019,” he said, suggesting small cap growth funds as a timely investment. Then came Natalie Holden with Touchstone Investments, part of the Western & Southern Financial Group, a 24-year-old group that prides itself in offering active management of their assets. She offered some insights on the markets stating that she did not see an inverted yield curve on fixed investments, expected one more interest rate hike in 2019 and suggested staying in shorter duration fixed income, She was bullish on emerging markets but not on Europe or Japan; and especially raved about India where a large portion of the population was young in their 20s and would become consumers. She also did not see signs of a recession in equities but expected more clarity after US-China trade talks in March. Last on was Kyle Anderson of Jackson Retirement Solutions, part of the Jackson National Life Insurance Company with offices in Lansing, MI; Chicago and Franklin, TN. He presented the case for variable annuities which would guaranty a 5 percent income by investing through any of the company’s 140 mutual funds; refund the entire amount to a beneficiary and never give up control of the annuity money. A brief exchange of questions and comments with the audience ensued afterwards and during dinner.